Consider the text of Matthew 19:9 where Jesus identifies who commits adultery in the case of divorce and remarriage. The passage is not preserved before the fourth century when there are three major variant traditions, one of which reads: "whosoever divorces his wife except by reason of sexual immorality makes her commit adultery and whosoever marries the divorced woman commits adultery;" another reads: "whosoever divorces his wife except for adultery and marries another commits adultery;" a third reads "whosoever divorces his wife except for adultery and marries another commits adultery himself and whosoever marries the divorced woman commits adultery." Here, between the variants, we have Jesus making opposite rulings about who is guilty in case of divorce. We have no way of knowing which of the textual readings, if any, is correct, but we know that at least two cannot be. We cannot appeal to the earliest text because all the variants are attested in the fourth century when the earliest manuscripts appear. The matter discussed in this passage is a very practical one with significant implications for Christian practice, one where the text is significantly corrupted, and the manuscripts reflect various biases. Until reading Gee's chapter, I didn't recognize that there was a question mark over that verse. If anything, it should make us more cautious in applying that passage. Such challenges are not unique to the Bible. There are uncertainties in the original manuscripts for the Book of Mormon, for example, in addition to printer's errors, and then there will be errors in translation for other languages, just as there will be in the Bible. We are grateful for the majesty of the scriptures, but must recognize that anything that has gone through human hands--the hands of scribes, translators, and printers, and even the hands of mortal authors, however prophetic and inspired--can have imperfections. Don't let that inconvenient truth shake you from the truths that have been revealed. It's an imperfect world, but we do have scripture and we do have modern prophets and apostles who can continue to guide us in the pattern that Christ established in the original Church of Jesus Christ. In a very realistic dream last night, I was with a missionary who was teaching a highly educated couple about the Word of Wisdom. They sincerely asked how God could be unhappy with them for drinking coffee. It's a fair question, especially with scientific evidence that coffee might have a variety of positive health effects (jury is always out on the impact of any one food or drink: positive effects in one area might be outweighed by harms in others, and much remains to be understood). It reminded me of an investigator I had in Switzerland who loved the Church but loved her coffee just a wee bit more, and stuck with this rhetorical question: "Why would the Lord reject me over a cup of coffee?" The answer, of course (IF the Word of Wisdom really was given by revelation), is why would we let our love for coffee come before the Lord? Why would we reject Him for such a trivial thing? It's a matter of faith, of course, that depends on recognizing Joseph Smith as a prophet. Once we suspect that may be the case, it's still fair or at least natural to ask about some of the details of the Word of Wisdom. Most of it is now understood to be very wise. But for all we know, the ban on coffee and tea in the LDS Word of Wisdom could be an arbitrary test of faith. Perhaps it could have been toast and jam, deep-fried fish. or ice cream and chocolate (heaven forbid!). An inconvenient and unpopular dietary restriction as a test of faith, perhaps? In the dream, I tried to find a way to help the couple understand the role of the Word of Wisdom. There were two disconnected concepts that followed. One was the image of people with a chain hanging from their wrist. It looked like a symbol of slavery, as many may view our dietary restrictions. Then a group of people with the chains stood in a circle and started spinning around, the loose end of the chain extending outward. The chains now were weapons that kept enemies away from the group. Kind of weird, but I guess that's a fair to look at the Word of Wisdom, especially the restrictions on alcohol, tobacco, and harmful drugs, and the emphasis on a healthy diet. The other concept in the dream, or in a waking moment after it, was that of a coach training his team. There are all sorts of rules that a coach may impose on team members, from "give me 50 push-ups now!" to numerous details of daily diet and exercise. Some of what he asks may be arbitrary and not all that helpful, but the journey of obedience and discipline is a valuable one aimed at taking his team to a higher level of success. If the Lord is our coach, we don't have to insist that He provide scientific evidence backing each aspect of His recommended dietary regimen. The discipline itself is part of the journey to excellence, not to mention obedience. Someday we may understand the Word of Wisdom with more clarity. For now, though, it's such a minor thing we're asked to do--what a pity if we let that stand between us and the Lord. Did either of these concepts help in teaching that couple? I'll let you know after the next installment in my dream series, if the sequel gets played. Though this verse was written for a different purpose, it also captures a situation that full-time missionaries can face each day when they have to go out and seek for people to teach. How easy it is to "dread the contempt of families" and instead "not go out of the door." In our "normal" lives, how easy it is to keep silent and not let others know what we believe and stand for, fearing the misunderstanding and even contempt that sometimes comes (though contempt may be imagined more often than actually faced). One thing, though, should motivate us to forget ourselves and stand as witnesses of God in appropriate ways: love. Our love for others and our love for the Savior can give us courage to rise above the fears of then natural man, that natural coward, and become Saints who share and testify of the truth. We will each have our own style, but when we are prompted to do something, to say something, that is the time to take a risk and open our mouths, in love and respect, but with courage. "Perfect love casteth out fear." (1 John 4:18) May we seek the miraculous gift of charity, the perfect love of Jesus Christ, that we may be useful instruments in the hands of God in serving and blessing others in this brief mortal journey. The PaleoJudaica blog offers a copy of a press release about the cache of metal plates from Jordan. Any of you have updated information to share? For some reason, part of me is always excited to learn about ancient writings on metal plates that have been preserved over the centuries. Guess I'm just into metal. Update 1, April 3, 2011: More interesting coverage on the topic emphasizes that some of the 70 tiny books are sealed with lead wire. 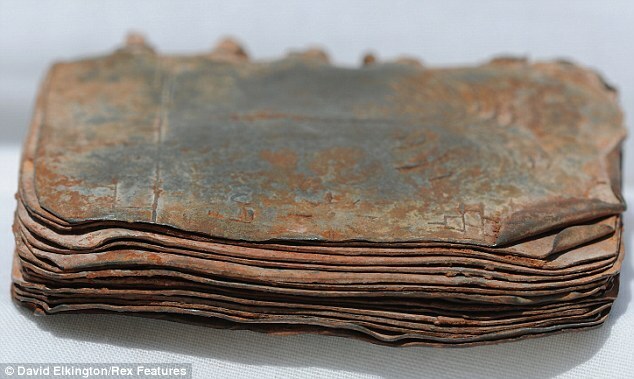 See the article, "Could this be the biggest find since the Dead Sea Scrolls? 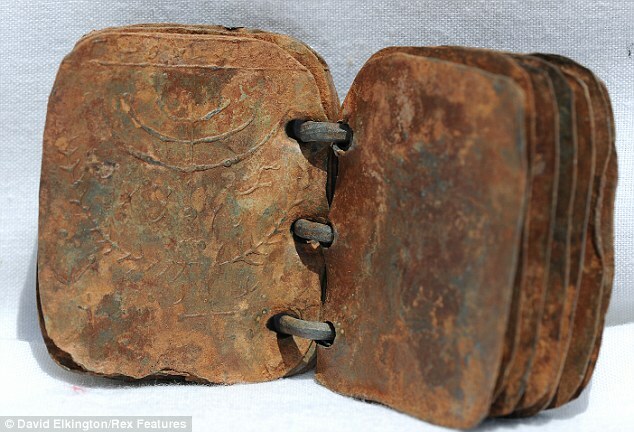 Seventy metal books found in cave in Jordan could change our view of Biblical history" at MailOnline. Check out the photos (two reduced samples are below). I look forward to further information--and hope these are actually authentic, unlike the Padilla Plates or the Michigan plates of slate that garnered interest for a while. Update 2, April 3, 2011: These may be fraudulent. Daniell McClellan raises a serious issue linking them to another recent fraud. Thanks to OpenMinded for giving me this lead on the bogus lead. Update 3, April 7, 2011: Also see an excellent discussion at An LDS Guide to Mesoamerica. Kudos to Daniel Johnson. Social upheaval is on my mind. When there is upheaval such as rioting in the streets, sooner or later we will be faced with the question Nephi had to ask during his family's trek across the Arabian desert: "Whither shall I go to obtain food?" (1 Nephi 16:23). It's a question that we may need to ask in the near future. The best time to ask it is before we face hunger, before a truckers strike, before riots break out, before the power grid goes down and shuts down commerce, or before a disaster wipes out parts of the supply chain for food and water. The best time to ask it is now when the answer is very easy and relatively non-miraculous: Wal-Mart or some other retailer with affordable prices. Build your supplies of food, water, and clothing gradually but fervently now before prices erupt much higher and before essentials simply become unavailable. I hope I'm wasting all of your time and money with this advice. If you are lucky, taking my advice will be a waste of your money because you'll never need it. But luck tends to favor the prepared. Prepare. We've seen riots break out in many nations when people are hurting economically. Ultimately, concern over the basics such as food can result in social upheaval or even mob behavior. Upheaval in the form of uprooting corrupt governments may be healthy if it's led by people with the wisdom to put something better in place of the old regime, but many of our revolutions in the past century have resulted in more hunger and sometimes mass starvation. There are powder kegs all over the world that can be ignited, resulted in sudden changes in society. Whether for good or for evil, such transitions often involve disruption in the food chain. Shipments stop, stores are looted or simply become sold out in a hurry, water supplies may be shut down, farm lands and energy sources may be destroyed. People will go hungry--even in lands spared from the horrors of earthquakes, tsunamis, and other natural disasters. Man-made disasters can strike anywhere. If people start going hungry here or anywhere else, things can get ugly. Kudos to Japan, though, for showing a mindset of cooperation, self-sacrifice, and civil order even in the worst of times. "Whither shall I go to obtain food?" Inquiring minds want to know--when it's a bit too late. Now is the time to be asking. Kari Huus of MSNBC has a story, "In Japan, the Mormon network gathers the flock." I recommend it. The only thing that rivals the Mormon church’s ability to spread the word is its ability to cope with emergencies. Within 36 hours of the earthquake striking off the coast of Sendai on March 11, the Utah-based Church of Jesus Christ of Latter-day Saints announced that all 638 of its missionaries in the country -- 342 Americans, 216 Japanese and 80 from other nations – were safe. Efforts have now turned to relief, not just for members of the Church in Japan but to the region at large as the Church works with the Red Cross and others. Appreciate the positive perspective from Kari Huus. I was living in Atlanta when Hurricane Andrew wiped out some regions of southern Florida, especially Homestead. I was one of thousands of Latter-day Saints who joined LDS-led relief efforts shortly after the hurricane struck. I was amazed to see how well the Priesthood organization functioned. Men who I suspect weren't all that great at home teaching, giving talks, or organizing a ward social all looked like real professionals when it came to stepping up to the challenge of helping a community reeling from disaster. Order, hard work, compassion, and kindness prevailed thousands poured into the grounds of LDS buildings to camp and work. Just amazing. The image of thousands of yellow T-shirts is still in my mind. They helped us recognize one another for increased order, and let the people know who were and reminded us who we were as well. I think they said "Mormon helping hands" or something like that. It was a tiring couple of days but well worth the sacrifice. So impressive to see how supplies and labor had been so effectively organized by people in the Church. Keep Japan in your prayers. Donations are good, too. Can't the Music Be Wholesome, Too? Is it too much to expect a grocery store to play music that parents (OK, maybe some parents) don't have to shield their children from? Sure, they are going to hear it out there in the unwholesome world we live in, but I wish Wholesome Foods would not be one of those sources of unwholesome music. Maybe the CEO will announce a new partnership with the Mormon Tabernacle Choir. Cool. Then I'll be back for dinner. Tonight my heart was pained over what is happening in Japan. I've begun praying more earnestly for the people in Japan, a wonderful country where there are many sweet and courageous people, including friends of mine, fellow Mormons, fellow Christians, fellow engineers, fellow bloggers, fellow sushi fans, fellow photographers, fellow innovation geeks, fellow jokesters, fellows of all kinds, and they are in deep trouble. We're at the point where miracles are needed. Real miracles. Yea, and if he say unto the earth -- Move -- it is moved. Yea, and we may see at the very time when he doth prosper his people, yea, in the increase of their fields, their flocks and their herds, and in gold, and in silver, and in all manner of precious things of every kind and art; sparing their lives, and delivering them out of the hands of their enemies; softening the hearts of their enemies that they should not declare wars against them; yea, and in fine, doing all things for the welfare and happiness of his people; yea, then is the time that they do harden their hearts, and do forget the Lord their God, and do trample under their feet the Holy One -- yea, and this because of their ease, and their exceedingly great prosperity. Yea, how quick to be lifted up in pride; yea, how quick to boast, and do all manner of that which is iniquity; and how slow are they to remember the Lord their God, and to give ear unto his counsels, yea, how slow to walk in wisdom's paths! In no way do I wish to suggest that this disaster is punishment upon Japan. It is a disaster that affects the whole world, the kind of afflictions and terror that occurs from time to time across the entire globe and over all the centuries. It's part of mortality, with bad things happening to good people all the time. These tragedies can be tools, though, to humble us and remind us of our mortality and our weakness and of our need for God. Helaman 11 reminds us of God's real power. He can make the earth move if He wishes. He can make the waters move. With that power, He can certainly move things in a way that will help the Japanese people avert the nuclear nightmare they now face. Is a little miraculous assistance now too much to ask for? Is it too much for us to plead with the Lord and point to the courage and goodness the Japanese people have shown in the midst of this disaster, to point to their great needs, and to please for special help for them, even as we prepare to do more on our own to help from afar? If we unite in prayer, can we not hope for miracles to avert the terror before them now? It may be too much to ask since far worse things have befallen other good peoples around the globe and continue to afflict them. Floods, earthquakes, famines, plagues, war have ravaged many, and we must not forget the former unspeakable horror we poured upon Japan with the fury of two nuclear weapons on civilian populations at the close of World War II. Mortal life can be brutal, and we knew this would be part of the ride even as we rejoiced at creation of the earth (Job 38:7) and at the prospect of coming here. We're all going to die, but thanks to Christ we're all going to live and this mortal drama will end in victory over the grave, and if we let Him, we'll have victory over sin and spiritual death as well. But for now, we must be concerned with our fellow mortals and their needs. Japan needs our prayers and help. The carnage in Libya right now also deserves our prayers and help, and so it is in many nations. Perhaps if we learn to unite in prayer and deed to bless others more fervently, to plead with God for extra help among many nations and peoples in need, including those we are close to here at home, we can see little and big miracles occur, and be guided to find better ways to make a difference with our own lives. We need more prayer, and perhaps we'll be able to see more miracles. Maybe not the big ones we want to read in headlines, but at least the small ones where souls are touched and God's greatest works are done. But a few headlines of miraculous good news would be welcome now, and I think I'll keep praying for that. During the 7 years that I've been blogging here at Mormanity, I've heard many complaints about the failure of prayer in seeking guidance from God. People tried it and it didn't work for them: they didn't get an answer, no personal revelation, no magic "burning in the bosom" or spiritual experience or majestic epiphany. Just nothing. I think many of those who have abandoned prayer left out the secret ingredient, or ingredients, that can make it most likely to bring revelation. I wish to recommend a better way to pray for those who are frustrated with it. For best results, add scripture study, especially right after prayer, and throw in some time to ponder and reflect upon what you read. I often like random scripture study--just throw open the Bible or Book of Mormon and read a while, then jump somewhere else if you wish. Sometimes methodical study of a topic helps using the LDS Topical Guide or other resources, and sometimes reading straight through on a reading plan will do. But I really think those who wish to gain revelation from God to guide them in their thinking and decisions need to consult what God has given us as tools for wisdom and growth. As we apply those tools to our unique situation, prayerfully seeking God's help, they scriptures can become alive and we can have true spiritual experiences. As we are riveted by the events in Japan, what can we learn and apply to our own situation? First, I am struck by the civility, courage, and kindness of the Japanese people. In spite of the chaos, society in Japan has not broken down into lawlessness. The Japanese apparently do not look for excuses to smash open shop windows and load up on loot. Social order and basic respect for one's fellow man can still pervade a people even in the midst of destruction and danger. That is inspiring. I hope my nation can learn from that. We can also learn about emergency preparation. The disaster was extreme, unexpected, and sudden. The tsunami would follow the earthquake by just a few minutes, making speedy evacuation critical to survival. Though many of you may not live in earthquake zones, we all live in regions where extreme disasters can strike, where we may have just a few moments to evacuate. Do you have a 72-hour kit ready to go? Something you can grab and run that will have what you need to live for three days or so until help arrives? This might be a backpack or other bag you can carry filled with things like basic first aid supplies, granola bars or other long-lasting items you can eat, bottled water, clothing, a radio, a flashlight, phone numbers and contact information, etc. This would be a good time to do a drill with your family in which authorities knock at your door (why not have your home teacher do this as part of the drill?) and give you 5 minutes, maybe less, to evacuate. Can you grab a bag and run? Have you thought through what you would do? One of the most important things to consider is where to meet after a disaster. This is essential in the case of a fire. Make sure everyone knows where to gather after escaping a house fire. A friend of mine died in a fire in his home because of inadequate preparation in this area. All of his family and another family got out safely, but some gathered in the back of the house and others in the front. He didn't know about the people on the other side of the house. He thought there was still a child inside, and ran back into the burning house armed with a water hose. There was a flash of fire and suddenly he was engulfed in flames. Heroic, yes, but unnecessary. Whether it's a chemical spill, a riot, an epidemic, flooding, fire, or whatever, we are all at risk. Be prepared. Storing food and water is more important than ever in these dangerous times. May we keep the Japanese people in our prayers and look for better ways to help from afar. Meanwhile, consider donating through the LDS Humanitarian Aid Fund. A classic old article by that unpredictable and delightful scholar, Hugh Nibley, is "The Early Christian Prayer Circle." For those wishing to better appreciate the ancient roots of the LDS temple experience, it's a great place to start. Nibley sees the ancient chorus and ancient ring dances as having temple-related roots. "Ring Dance" is also one of my favorite sculptures, a landmark of Appleton, Wisconsin where I live. 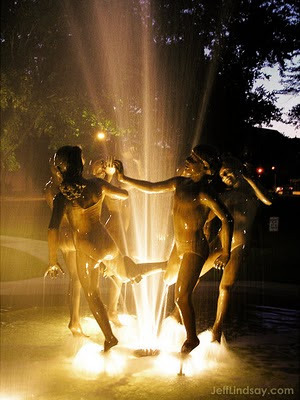 The beautiful sculpture is a water fountain in Appleton's downtown City Park. 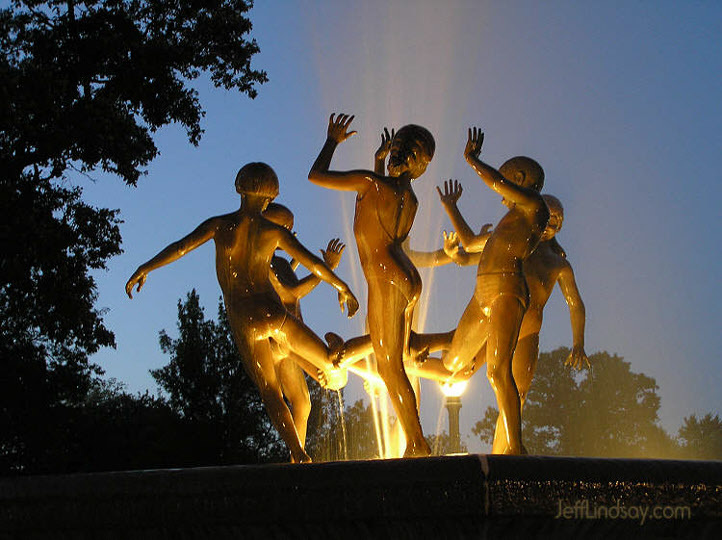 It depicts children in swimsuits joyously playing as they interlock their ankles (not something from the Temple) and do a ring dance around the fountain. It's a monument to the joy of being young and the fun of human friendship and play. A couple of my photos of it are below. Interestingly, the artist, Dallas Anderson, was a Danish convert to the Church who taught art at BYU for a while before coming out to the Midwest. He lived and recently died here in Appleton. I had a chance to speak with him briefly before he passed away. He was a kind old man, an intellectual, and a tremendous artists who had left the Church after running into some anti-Mormon literature that took the wind out of his spiritual sails. His story, what little I know of it from our brief conversation, reminds me of the need to be patient and understanding of good people who leave the Church for reasons that seem valid and hard to refute. It also reminds me of the need to make answers to anti-Mormon attacks easier to find. There are good, kindly people who have been led away unnecessarily. Some say they are better off, but they are missed, and I fear they are missing something of great worth. All these thoughts--Nibley, the Temple, good people who leave the Church, and the joy of human friendship--are stirred when I see our famous Ring Dance fountain in Appleton. "Alma's Enemies: The Case of the Lamanites, Amlicites, and Mysterious Amalekites" from the Journal of Book of Mormon Studies, 2005, resolves several questions about the narrative in the Book of Alma by showing that the mysterious Amalekites, enemies of the Nephites, were actually the Amlicites that are introduced with much fanfare at the beginning of Alma's record and then mysteriously vanish in the text. There are several reasons for concluding that the two groups are the same, and that the reason we have two different names is due to confusion by the scribe and printer in dealing with the names dictated by Joseph. And yes, it's a mistake that slipped by Joseph Smith himself. Resolving the error and recognizing the two groups as one greatly strengthens the text and brings unity to the Book of Alma while resolving other issues as well. It's one more example of the text of the Book of Mormon, the ancient text, being "smarter" than Joseph Smith. There is more depth, more unity, and even more poetry to it than Joseph could have realized, let alone created. Methuselah and the Patriarchs: Bizarre Longevity Explained? How did the early patriarchs in Genesis manage to live for hundreds of years? Methuselah, for example, lived to be over 900 years old. Remember, this was before multilevel marketing and long before informercials, so they had no chance to buy the latest longevity-enhancing miracle foods. This was even before multivitamins, before x-rays, before antibiotics, and still long before pharmaceutical companies crafted the brew of 30 or 40 pulls a day that many folks need to reach even 70 years of age. How could those guys live so long? This was a mystery until the very recent discovery of the Not Quite Dead Sea Scrolls. Though authenticity still needs to be verified, there are several exciting breakthroughs in knowledge from this collection of early writings engraved on ancient aluminum foil. Scroll MX13 indicates that the earliest records were kept by the world's first company, Adam & Sons LLC, a law firm. Those 969 years that Methuselah put in? That's billable hours. Yes, the entire history of the patriarchs was recorded in billable hours. Methuselah's life span based on conventional time was actually around 62 years. Those who weren't partners in Adams & Sons didn't get nearly as many hours credited to their accounts, for some reason, and arguably were short-changed in the record keeping. For example, the billion of years required for the preparation and creation of the earth were credited with just six days of work. Another clash between science and the Bible has been resolved. It's about time. Yes, I'm proud of BYU for putting principles first and being willing to jeopardize basketball glory by removing a key member of the team for an honor code violation. I wish we had that kind of integrity in more parts of our country. But I also feel terrible for the player affected and wish that the media (as in the Salt Lake Tribune) wouldn't repeat the alleged misdeed that got him booted. Really, does the whole world have to know that he confessed to missing three months of home teaching in a row? Or was that two months? Actually, it's none of my business. The real story here, though, may not be isn't the integrity of BYU, but might be the courage and integrity of starting forward Brandon Davies, the young man who, after slipping up in some part of his life, hopefully did what he believed to be right to come clean--even though it would deprive him of a chance to compete for basketball glory on a team ranked #3 in the nation. Repenting and doing what he understood to be right in God's eyes was more important. Sure, it would have been better if hadn't gone astray in the first place, but everyone slips up in various ways and we all need to turn and repent to come back to the Savior. Sometimes the price seems high, as it does in this case, but my guess is that he's a far better man for having made the painful decision to come clean. Thank you, Brandon, for your courageous choice. Update: March 5 Stories are never as simple as they seem at first. I realize that I don't know if there was a courageous choice or not that Brandon made, so I've edited my last paragraph to be a little less certain. The word "hopefully" is newly added. I had a surreal experience in New York recently. After checking in to my hotel, I was given the key to my room, room 238, and told that I could access the elevators around the corner, a little to the left of the lounge area with a fireplace and several people sitting in comfortable chairs. I went to the elevators, stepped inside one, and pressed the button for floor 2. I normally take the stairs, but hadn't seen a stairwell, so I went with the nearby elevator on what should have been a very short trip. The doors slowly closed. I turned and noticed I was surrounded by mirrors. I could see something white on my lapel, so I pulled it off and examined it. It was delicate and wispy, perhaps a piece of down. I let it go and marveled at how it just stood there in the air, barely descending. For maybe ten seconds I stared at it, pleasantly surprised that I, normally always in a rush, could just stand there and enjoy the almost surreal experience of watching a piece of down suspended in midair in a mirrored elevator that was moving so ... very ... slowly. There I was, patiently suspended between floors in what must have been the slowest but most gentle elevator I had ever been in. I smiled and turned toward the door and waited. Then I waited some more. I wondered if the elevator had become stuck between floors, and contemplated the movies I had seen in which people were trapped in elevators for hours. A moment of worry, but that faded quickly. I was intrigued to see that I could so patient. Finally, there was a ding and then the door opened. A woman stepped in and I stepped out onto the second floor. I turned to the left and soon found my room, room 238. A few minutes later I left the room and started back to the lobby. As I approached the elevator area--I still hadn't seen a stairwell--I was surprised to look down the hallway past the elevators and to see that on this, the second floor, there was also a lounge with a nice fireplace, just like the one I had passed on the first floor. There were also some people in comfortable chairs there talking. What, a second floor lounge also? I walked toward it and noticed that there was a swimming pool here on the second floor. As I continued toward the lounge and looked to my right, it all became clear. The second floor of this hotel was the main floor, the one I was on when I checked in. It wasn't so much the elevator that was extremely slow, but its passenger. How often we do we step into elevators, anxious for them to take us to our destination, when we are already where we need to be? How often do we grow frustrated about the slowness of the journey when the Lord has already put us in the right place and it's time for us to move on our own instead of waiting for something or someone else to move us? Finally, how often do we marvel at our own virtues--patience, in this case--when we are actually being rather dense? I stepped into an elevator and became pleased at how I could be so patient and enjoy the slow ride from floor one to floor two. I stepped out feeling full of Zen-like wisdom. Any outside observer, however, would have seen a guy on the second floor step into an elevator and just stand there for about a minute before some other passenger came along, pressed the button, and released a stationary fool from his delusional ride. Yeah, it was a surreal experience.